My nightmare! And I know I’m not alone. I love getting my pups groomed. Shiny, brushed-out coats. The sweet smell of perfume…until they jump into the creek. Ugh! But I always worry when I drop them off at the groomer. Somewhere, in the back of my mind, I worry. Will the groomer be nice? Do they really love dogs like I do or is it just a job to pay bills? What if Sandy, my sassy little girl, doesn’t cooperate while they’re bathing her? Will they be sweet? Or mean? Maybe even hurtful. 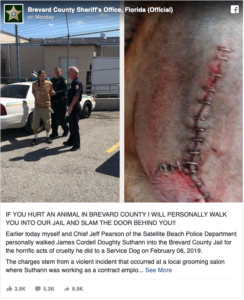 Brevard County Sheriff Wayne Ivey stated that the Florida groomer was arrested after he attacked a veteran Rick McGuire’s 8-year old German Shepherd service dog. The attack was so vicious that the dog’s tail needed to be amputated. The groomer, James Corell Suthann, 37, of Satellite Beach, was charged Monday with one felony count of animal cruelty. Check Out the Brevard County Sheriff’s Office Response. Love this!! The attack occurred when TT, a veteran’s service dog, would not be still during grooming. Suthann became angry and can be seen abusing the dog. Surveillance video shows Suthann cinch the dog’s head down so tightly, she could not move. The service dog was obviously in pain. Then Suthann grabbed the dog’s tail, lifting the dog off the ground and twisting it a full 360 degrees. The damaged caused was too extensive, and the tail could not be reattached. It was later amputated. TT was also struck in the head with a hose nozzle, according to the sheriff’s office. Brevard County Sheriff Wayne Ivey and Satellite Beach police Chief Jeff Pearson personally escorted James Cordell Doughy Suthann to jail following his arrest on Monday. TT is recovering from emergency surgery to remove the injured tail said her devastated loving veteran papa who suffers from PTSD.